Liberate your servers and move to an Open Virtualization Platform – Go Open Source! 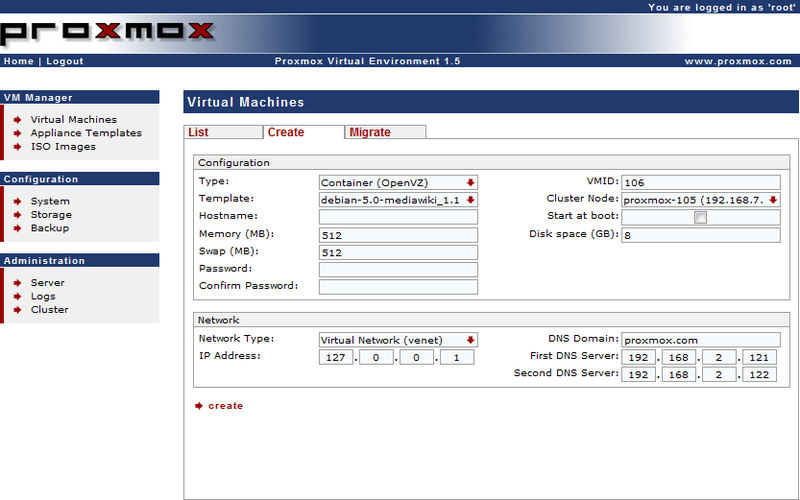 Proxmox VE (Virtual Environment) or PVE for short is a freely distributed Linux-based operating system based on Debian GNU/Linux and engineered to by deployed as an open source virtualization computing environment for running virtual machines and virtual appliances. It is distributed as a single, installable ISO image that’s easy to use, easy to install and easy to configure. The end product will be a full featured server machine based on KVM (Kernel Virtual Machine) and designed for handling virtualization tasks. During the boot sequence, you can press the F2 key to enter verbose mode and see how the operating system loads its components. In a few seconds you will be greeted by a license agreement, so click on the “I agree” button to accept it and start the installation process. When booting the ISO image for the first time, you will notice that there are no boot options and your only choice is to install the operating system on a local disk drive. For that, you can press enter immediately after the boot prompt or wait a few second for the medium to start. The installer will automatically partition the disk, detect and configure your computer’s hardware components, as well as to install all the necessary packages. All you have to do is to click the “Next” button, select the country, timezone and keyboard layout if they are not automatically detected, as well as to add a password and email address. Next, you will need to configure the hostname, IP address, netmask, gateway and DNS server. After the actual installation process, you can access the user interface through a web browser, on a different computer. Proxmox VE is designed from the ground up to deliver one of the best virtualization server environments for managing virtualized networks, virtual machines, storage and high-availability clusters.